26/10/12 -- Soycomplex: Nov 12 Soybeans closed at USD15.61 1/4, down 2 3/4 cents; Jan 13 Soybeans closed at USD15.63 3/4, down 2 1/4 cents; Dec 12 Soybean Meal closed at USD483.40, up USD2.00; Dec 12 Soybean Oil closed at 50.96, down 49 points. Fund selling in beans was estimated at around 2,000 contracts in end of week book squaring. Nov 12 beans were 29 1/2 cents higher on the week, with Dec 12 meal up just shy of USD20 and oil shedding 62 points. Yesterday's USDA numbers showed that the US has almost 73% of projected 2012/13 soybean sales either already shipped or on contract versus around 50% normally. Planting is just getting underway in Argentina at 2% complete versus 6% normally, according to the Buenos Aires Grain Exchange. They estimate a record 48.7 million acres of beans getting sown in Argentina this year, an increase of almost 5%. Argentina's Ag Ministry estimate their 2012/13 bean crop at a record 55-60 MMT versus the previous record of 52.7 MMT set in 2009/10. We know that South America will plant record soybean acres this year. From here on in it's weather that holds the key. In Brazil "Showers across Parana and Santa Catarina this weekend and next week should further improve moisture there. Some slight improvements are also expected in drier areas of northwestern Mato Grosso do Sul later next week, although more showers will still likely be needed there to end dryness and crop stress," say MDA CropCast. The US harvest is expected to be as much as 90% complete in Monday night's USDA report. Corn: Dec 12 Corn closed at USD7.37 3/4, down 4 1/4 cents; Mar 13 Corn closed at USD7.39 3/4, down 4 1/4 cents. Fund selling was placed at a modest 1,000 contracts on the day. For the week Dec 12 corn was 23 3/4 cents lower and Mar 13 lost almost 20 cents. The Buenos Aires Grain Exchange say that 37% of the Argentine corn crop has been planted compared to 55% normally at this time, as rains cause delays. The Ukraine corn harvest is 76% complete at 14.47 MMT, and looks like ending up closer to 19 MMT than the 21 MMT that the USDA suggest. Exports may also fall short of USDA expectations. "Dry weather across the central and western Midwest this weekend and early next week will allow late harvesting of corn and soybeans to progress well," say MDA CropCast. The US corn harvest could reach 95% complete in Monday night's USDA report versus 87% a week ago, the trade estimates. US corn remains too expensive on the international stage compared to South American and Ukraine origin, but supplies of those should become tight by the New Year. In the meantime, US exports and demand from the domestic ethanol sector continue to lag USDA projections significantly. Wheat: Dec 12 CBOT Wheat closed at USD8.63 3/4, down 9 cents; Dec 12 KCBT Wheat closed at USD9.09 1/4, down 5 cents; Dec 12 MGEX Wheat closed at USD9.40, down 5 1/4 cents. Funds were said to have been net sellers of around 2,000 wheat contracts on the day. For the week Chicago wheat was 8 3/4 cents lower, with Kansas wheat up 1 1/4 cents and Minneapolis down 2 1/2 cents. Concerns over the health of US winter wheat remains. "The forecast is very dry in the US heartland in the 7 day outlook. This is very unfavourable for hard red winter wheat. Conditions in the Southern Plains breadbasket have turned suddenly dry, following fairly good rainfall in September. Last week gusty winds stirred up loose dirt causing a dust veil across Nebraska, Kansas and Oklahoma, visible on satellite imagery. Root establishment in winter wheat is weak because of insufficient topsoil moisture. 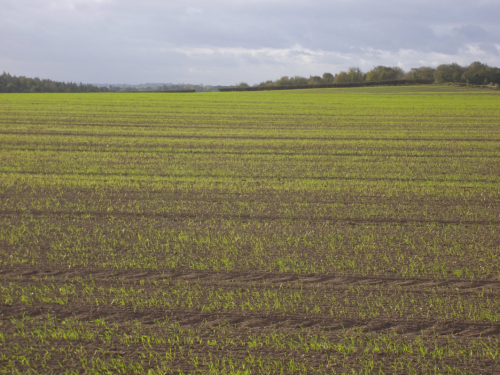 Only 51% of hard red winter wheat had emerged compared to 82% planted by October 21. Worsening drought this month is the reason for slow seed germination," say Martell Crop Projections. "Colder temperatures across the Plains over the next few days will result in some widespread burnback to the wheat, as temperatures are expected to dip into the 20s F in many areas," say MDA CropCast. 26/10/12 -- EU wheat ended mixed, but mostly firmer, to end the week with Nov 12 London wheat up GBP0.25/tonne to GBP209.50/tonne and with Nov 12 Paris wheat rising EUR1.50/tonne to EUR264.25/tonne. For the week that places Nov 12 London wheat GBP5.25/tonne higher, whilst Nov 12 Paris wheat gained a more modest EUR1.50/tonne. This also sets an 18-month highest closing level for a front month on the weekly chart for London wheat, which is now within GBP8.00/tonne of the all-time record closing high of GBP217.50/tonne set on 20 Apr 2011. 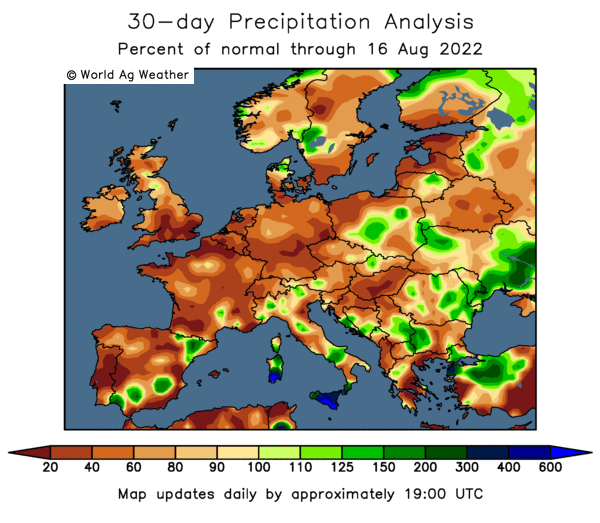 The market is also getting anxious about prospects for 2013, with plantings across western Europe delayed by soggy field conditions and forecasters now calling for Arctic weather to hit some areas this weekend. Nov 13 London wheat gained GBP7.50/tonne this week to close at GBP186.25/tonne, just below the lifetime contract high of GBP187.00/tonne set on Thursday. Brussels issued 242 TMT of soft wheat export licences this past week, bringing the marketing year-to-date total to 4.9 MMT, up 9% on 4.5 MMT this time a year ago. Barley export licences are 31% up on year ago levels at 2.1 MMT. International demand is clearly out there, and these sales come against a backdrop of aggressive Black Sea exports in Q1 of 2012/13, a factor likely to be largely missing for the remainder of the season - at least in the case of wheat. Ukraine said that it's grain harvest is now 92% complete at 40.76 MMT, with average yields down 14% at 2.98 MT/ha. The corn harvest is ongoing, at 76% done, producing 14.47 MMT to date, which implies a final crop of around 19 MMT - not the 21 MMT that the USDA are expecting and a reduction of almost 17% on last year. The Ukraine Ministry estimate corn exports at 12 MMT this season, half a million tonnes less than the USDA and 25% down on last year. They also confirmed this week that wheat exports will cease on 15 Nov.
Russia's Ag Ministry said that 99% of their wheat harvest is complete, producing 39.6 MMT - down 32.5 % from a year ago. Argentina's wheat harvest is only 4% complete to date, hampered by rain which may cut yields and quality this year. The corn crop is only 37% planted against 55% normally for similar reasons, say the Buenos Aires Grain Exchange. They estimate the Argentine wheat crop at 10.12 MMT, down 23% from 13.2 MMT a year ago and well below the USDA's forecast of 11.5 MMT. Australia's wheat harvest is also underway, with early yields said to be pretty disappointing. Most private forecasts for wheat output Down Under this year are in the region of 19-21 MMT, versus 29.5 MMT last year and 23 MMT from the optimistic USDA. Spain's National Statistic Institute say that Q3 unemployment there rose above 25% for the first time since 1976, with 52% of 16-24 year olds out of work. Clearly this makes it increasingly difficult for the Spanish government to pay it's debts, increasing the likelihood of a bailout request. The market would view lending Spain more money with which to hang itself as a good thing. 25/10/12 -- Soycomplex: Nov 12 Soybeans closed at USD15.64, down 6 1/2 cents; Jan 13 Soybeans closed at USD15.66, down 6 1/4 cents; Dec 12 Soybean Meal closed at USD481.40, down USD0.50; Dec 12 Soybean Oil closed at 51.45, down 39 points. Fund selling in beans was estimated at 3,000 contracts on the day. Weekly export sales of 522,200 MT fell a little below trade estimates of 600-900 TMT. Shipments however were very strong at 1,641,600 MT of which China took a whopping 1,135,900 MT. That's the fourth week in a row that actual shipments have been above 1 MMT, and constitutes the highest weekly total since Feb 2011. This weeks sales bring total 2012/13 commitments to 25 MMT, or 72.5%, versus the USDA's projected 34.5 MMT for the entire season. The USDA also announced the sale of 120 TMT of soybeans to "unknown" for 2012/13 shipment, probably partial confirmation of some of the recently rumoured Chinese business. The Chinese government sold only around 10% of the state-owned soybean reserves it offered at auction today due to a hike in the asking price. Corn: Dec 12 Corn closed at USD7.42, down 12 1/2 cents; Mar 13 Corn closed at USD7.44, down 12 cents. Fund selling was estimated at 10,000 contracts on the day. Weekly export sales of only 142,300 MT were a little below the relatively modest trade expectations of 150-375 TMT. That figure included decreases for China of 120,300 MT. Weekly sales of around 430 TMT are needed to achieve the USDA's projected export target of 31 MMT this season. Total commitments for the 2012/13 are only 34.7% of this USDA target at 10.7 MMT. This time last year that total was 20.5 MMT. Actual shipments were only 290 TMT, also in complete contrast to those for soybeans. The IGC cut their world corn production estimate by 3 MMT to 830 MMT, 5% down on 876 MMT last year. Ending stocks were trimmed 1 MMT to 117 MMT which is 13% down on last season. Excessive rains in Argentina may see some intended corn acres shift into soybeans. MDA CropCast cut their Argentine corn production estimate by 360 TMT from last week to 26.65 MMT for this reason. Wheat: Dec 12 CBOT Wheat closed at USD8.72 3/4, down 11 1/4 cents; Dec 12 KCBT Wheat closed at USD9.14 1/4, down 7 cents; Dec 12 MGEX Wheat closed at USD9.45 1/4, down 9 3/4 cents. The IGC cut it's world wheat crop estimate by 2 MMT from last month to 655 MMT, a 5% drop on last season's 690 MMT. Ending stocks were trimmed 3 MMT to 172 MMT - a 14% stocks to usage ratio. Weekly US export sales came in at 572,000 MT, a bit better than the 250-450 TMT expected. Actual shipments were 379,600 MT. Total year-to-date commitments are 14.34 MMT, which is less than half the USDA's projected 31.5 MMT. The wheat marketing year is Jul/Jun though, as opposed to Oct/Sep for corn and soybeans. Iraq has pushed back its tender to buy a nominal 50 TMT of optional origin wheat. They are expected to buy considerably more than that, although none of it is likely to be of US origin. "Export forecasts (for 2012/13) have been cut for the US and Australia in favour of bigger shipments by Russia and India," the IGC said. The trade expects US wheat exports to improve in the second half of the season. 25/10/12 -- EU grains closed mixed on the day with Nov 12 London wheat up GBP3.00/tonne to GBP209.25/tonne whilst Nov 12 Paris wheat was EUR4.00/tonne lower at EUR262.75/tonne. Both Nov 12 and Nov 13 London wheat both closed at lifetime contract closing highs. Interest in Nov 13 London wheat is picking up markedly. It was trading at a GBP29.20/tonne discount to Nov 12 at the beginning of the month, that is now down to GBP22.60/tonne. France is starting to take centre stage as the premier supplier into North Africa and the Middle East, but as we are only a third into the 2012/13 marketing year their surplus stocks could run down quickly in the middle third of the season. That potentially leaves the US to step in and pick up the slack in the final third of 2012/13. Global inventories will be pretty tight by then. Morocco, who are the third largest wheat buyer in North Africa, may have to import 27% more wheat in 2012/13 than last year after their soft wheat crop fell by more than a third this year after minimal amounts of rainfall from December until early March had an adverse effect on output, says the USDA attaché there. Following China's sudden and surprising arrival in the world wheat import market, Martell Crop Projections highlight a comments from a recent Syngenta market report: "China is like an elephant in the corner. Even though it is sitting silently, it takes up the majority of the room and you cannot ignore what might happen if it does something unexpected." The IGC report a reduction in world wheat supplies of 2 MMT from last month to 655 MMT and a reduction of 3 MMT in world 2012/13 carryout versus their September projection. Year-on-year that's a decline of 5.6% in production and over 12% in ending stocks. They also predict a 3 MMT decrease from last month in the world corn crop this year to 830 MMT, some 5% below last year's output of 876 MMT. IN addition "the outlook for rapeseed/canola has tightened sharply owing to reduced crop prospects in Canada. Global ending stocks are expected to fall by almost one-quarter, including a steep decline in the two major exporters," they say. 25/10/12 -- Just back from a whirlwind tour of Ireland speaking to a couple of groups of pig farmers over there, and very nice guys they were too. I did my best to support the local economy and malting barley market as you might imagine. Driving around the Irish countryside one thing that stuck me was the inordinate number of bungalows scattered around the place. What is it with bungalows over there? The guy checking into the hotel in front of me last night was told to go round the corner, past the restaurant and up a small flight of stairs to get to his room. I was half expecting him to say "stairs, what the feck are they?" The bar area looked like a scene from My Big Fat Gypsy Wedding. The blushing bride appeared to be wearing a kind of black lace shawl underneath her wedding dress, which upon closer (but not too close) inspection turned out to be an almost entirely tattooed upper torso. Lord knows what the lower half resembled. The old joke about the woman having Mike Tyson badly tattooed on one inner thigh and Lennox Lewis on the other, whipping her skirt up to show her husband who promptly said "I don't know who those buggers are but that's definitely Don King in the middle" sprung to mind. Anyway, back to the grind. The overnight grains are mixed, one to two cents lower on beans and wheat and half a cent or so firmer on corn. London wheat is up again, although Paris is mostly a little lower. Open interest in Nov 12 London wheat continues to drop I see, now down to well under a thousand lots. Activity in Nov 13 is picking up. We've barely got the 2012 harvest in and we are already fretting about 2013, and with pretty good reason too it would seem. The spread between the two Nov positions in London was almost GBP30/tonne at the start of the month and now it's close to being GBP20/tonne. In South America strong thunderstorms erupted overnight in Parana, Brazil's top corn state and second leader in soybean production, where conditions have hitherto been very dry, according to Martell Crop Projections. "The 3-day rainfall outlook calls for another 40 to 75 mm (1.6 – 3 inches) as low pressure stalls in Parana and northern Rio Grande do Sul," they add. In contrast Mato Grosso, Brazil’s top soybean state, has "received disappointing rainfall recently. It appeared as if the rainy monsoon season was finally getting started earlier this month. However, the forecast now calls for lighter rain with scattered coverage. In the Brazil tropics, daily rainfall of 5-6 millimetres is typical, once the monsoon gets underway. The month of October usually brings 100-150 millimetre of rain (4-6 inches). If the drier weather continues, it would delay soybean planting. "A stark temperature contrast is developing in South America. North of Parana, very hot temperatures are predicted. Mato Grosso highs are expected to reach 35-37 C (over 95 F). In Parana, where thick clouds and strong thunderstorms are occurring, temperatures would be only mid 20s C (upper 70s F)," they conclude. Across the border "Argentina temperatures were in the 60s F in Buenos Aires province yesterday and well below normal. With wet field conditions and cool temperatures, corn planting is making slow progress. "Since mid October, 65 mm (2.5 inches) of rainfall has developed in the Argentina grain belt and 45% above average. September was very wet also. In fact, widespread flooding developed last month in the western and central parts of Buenos Aires, confirmed by remote satellite sensing. "Local sources maintain it is not too late to plant corn in late October-early November. We wonder if that idea applies to Buenos Aires province, where the climate is cooler. 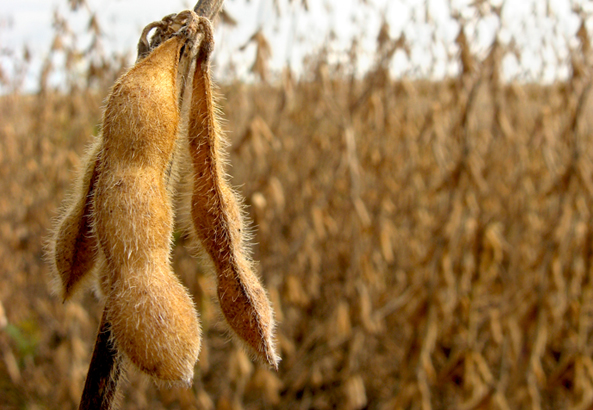 If wet conditions persist into November, growers may consider switching to soybeans," they say. 24/10/12 -- Soycomplex: Nov 12 Soybeans closed at USD15.70 1/2, up 17 1/4 cents; Jan 13 Soybeans closed at USD15.72 1/4, up 16 1/2 cents; Dec 12 Soybean Meal closed at USD481.90, up USD5.70; Dec 12 Soybean Oil closed at 51.84, up 52 points. Funds were said to have been net buyers of around 6,000 soybean contracts on the day. The USDA said 105,000 MT of US beans were sold to unknown. Rumour continues to circulate that China has been buying on this recent dip, maybe we will get some confirmation of that in tomorrow's weekly export sales report? Trade estimates for beans are 600-900 TMT versus last week's 525,200 MT. Weekly shipments will also likely reaffirm the recent strong pace of exports slanted heavily in favour of the first half of the 2012/13 season. Celeres said that 47% of the 2012/13 Brazilian bean crop has already been sold. Continued wetness in Argentina may see some intended corn acres shift into beans. Corn: Dec 12 Corn closed at USD7.54 1/2, down 1 1/2 cents; Mar 13 Corn closed at USD7.56, unchanged. Funds were said to have been around even on the day. It is interesting to note that Mexico imported 7.82 MMT of corn in 2011/12, with 99% of it coming from the US. Yesterday Mexico bought 270 TMT of non-US corn. Estimates for tomorrow's weekly export sales report are 150-375 TMT versus 166,700 MT last week. Weekly sales need to average 420 TMT/week to meet the current USDA target for 2012/13. This week's ethanol production data shows output at 801,000 barrels/day this past week. A year ago that total was 909,000 barrels/day. As well as US corn exports lagging, cumulative ethanol production data suggests that demand for corn from that sector will also fall short of the current USDA target for 2012/13. MDA CropCast cut their Argentine corn production estimate by 360 TMT to 26.65 MMT from last week due to continued wetness forcing acreage reductions there. Wheat: Dec 12 CBOT Wheat closed at USD8.84, up 15 1/4 cents; Dec 12 KCBT Wheat closed at USD9.21 1/4, up 13 1/2 cents; Dec 12 MGEX Wheat closed at USD9.55, up 10 cents. Ukraine formally confirmed their Nov 15 wheat export ban. We know that some sales have been made for delivery beyond this date, including to Egypt. The trade is speculating therefore that Ukraine traders may have to claim force majuere on those sales, leaving the buyers to re-enter the market. Trade estimates for tomorrow's weekly export sales are 250-450 TMT versus 410,000 MT last week. Accumulated US wheat sales are nothing special, but the trade believes that these will pick up significantly in the second half of the season as Black Sea supplies dry up. In the US "dry conditions prevailed across the Plains much of this past week, which maintained considerable moisture shortages across central areas. Colder temperatures across the Plains this week will burn back wheat growth and will slow establishment of the crop," say MDA CropCast. 24/10/12 -- EU grains rose with Nov 12 London wheat adding GBP1.50/tonne to GBP206.50/tonne and Nov 12 Paris wheat gaining EUR3.50/tonne to EUR266.75/tonne. Nov 13 London wheat set a fresh lifetime contract high of GBP186.00/tonne before closing just below that level at GBP185.90/tonne for a net gain of GBP3.15/tonne on the day. Official confirmation of the Ukraine Nov 15th wheat export ban came from the Ag Minister there, boosting prices. Egypt have wheat bought from Ukraine for Nov 11-20th and 21-30th shipment. It is unclear what will happen to these purchases now. The Ministry also said that the domestic grain harvest is 91% complete producing 40 MMT so far. Yields are averaging 2.97 MT/ha versus 3.44 Mt/ha a year ago, almost 14% down on a year ago. Corn harvesting is at 73% done, producing 13.78 MMT so far, suggesting a final crop around 19 MMT which is a couple of million below the USDA's latest forecast. The Ministry are calling for a crop of 20 MMT and exports of 12 MMT this season. News that China imported 524 TMT of wheat in September caught the eye, especially in light of it's recent 295 TMT purchase of Canadian wheat. That may signal that current corn prices could stimulate wheat usage there. Russia's Ag Ministry said that the country had exported 9.32 MMT of grains so far this marketing year (Jul 01-Oct 17), a fall of 19% year-on-year. Rosstat said that domestic grain stocks held in commercial hands as at Oct 01 were 12.7 MMT down on the same date last year at 35.8 MMT, a drop of over 35%. Agritel estimate the Australian wheat crop at 21 MMT, down 29% on last year. They also forecast the Argy wheat crop at 11.5 MMT, a fall of 26% on a year ago. 23/10/12 -- Soycomplex: November beans closed 6 3/4 cents higher at USD15.53 1/4. Meal was USD5-6 higher and oil down around 20-35 points. The Rosario Exchange said heavy rains in Argentina may continue to delay soybean plantings, although the 6-10 day weather forecast for is drier. Southern Brazil is dry, slowing new crop bean plantings. Corn: Corn closed around 5-3 cents lower on global economic concerns and harvest pressure. The USDA last night pegged the US corn harvest at a record 87% complete versus just 49% normally. The USDA announced that 270 TMT of corn sold to Mexico that was previously reported as optional origin was being switched to non-US origin, presumably either Brazilian or Argentine. Excessive wetness in the latter remains a problem, whilst parts of Brazil are still too dry. Wheat: Chicago wheat closed around 2-3 cents weaker. Iraq's wheat crop was estimated 12% down this year at 2.1 MMT due to dryness. 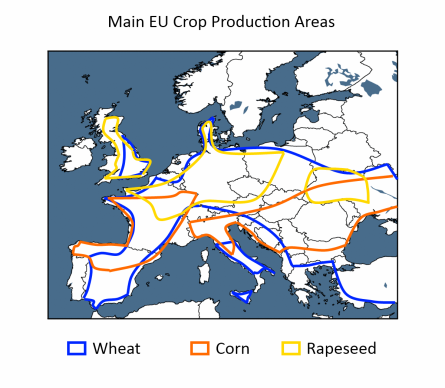 They are seen importing a record 5.3 MMT of cereals in the 2012/13 crop year, according to the FAO. US winter wheat planting is in line with schedule, but emergence lags normal as farmers scan the skies for rain. There isn't much of that in the forecast for the Great Plains. 23/10/12 -- EU wheat ended mixed Tuesday with Nov 12 London wheat down GBP1.50/tonne to GBP204.50/tonne and with Nov 12 Paris wheat down EUR0.50/tonne to EUR262.50/tonne. In early morning trade the pound had fallen as low as 1.2250 against a broadly firmer single currency, it hasn't been below 1.22 since the first day of May. There are plenty of concerns around regarding the state of wheat prospects around the world to keep the market underpinned as we head into winter it would seem. At home in Europe the wet, dank and grey summer has given way to a wet, dank and grey autumn with similar winter around the corner it appears. 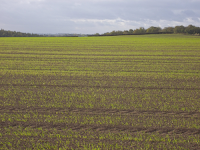 Planting conditions in the UK, western Germany and France are far from ideal which is supporting new crop months. Australia's wheat production estimate of 23 MMT from the USDA is 3 MMT too high, according to the Australia New Zealand Bank. US winter wheat sowings are in line with normal at 81% done, but what has been sown desperately needs rain, and there's precious little in the forecast. "Showers are developing today in southwest Oklahoma. Later this week on Thursday-Friday another weather disturbance is expected to produce welcome rain and wet snow on the High Plains wheat growing area in Colorado and Nebraska. Kansas - the leading US wheat state - is not expecting meaningful precipitation this week. Soil profiles are still dry from severe drought last summer in the Great Plains. Very heavy rain would be required to replenish the deep soil layer," say Martell Crop Projections. Ukraine's early season exports are tearing along, up 73% year-on-year, at 7.65 MMT, of which 3.82 MMT is wheat, according to the Ministry there. The say that wheat exports will be finished by around 15-20 November. French wheat exports are expected to pick up sharply in the second half of the season as Black Sea supplies run dry. FranceAgriMer predict French wheat stocks may decline to only 1.8 MMT by mid -2013, the lowest carryover since record keeping began in the late 1990s, add Martell Crop Projections. 22/10/12 -- Soycomplex: Nov 12 Soybeans closed at USD15.46 1/2, up 12 1/4 cents; Jan 13 Soybeans closed at USD15.49 1/4, up 12 3/4 cents; Dec 12 Soybean Meal closed at USD471.00, up USD7.20; Dec 12 Soybean Oil closed at 51.66, up 8 points. Fund buying in beans was said to be around 3,000 contracts on the day. Most of Argentina remains too wet, and parts of Brazil are too dry. Talk of Chinese buying under the counter at these levels persist. Current US prices are very attractive compared to domestic Chinese levels. Meanwhile the South American crop is at least four months away, with soybean planting in Brazil only around 16% complete, according to Safras e Mercado. US soybean harvesting is 80% complete, versus 71% last week and 69% on average, the USDA said after the close. Weekly export inspections remain robust at 61.42 million bushels, suggesting another bold week of shipments. Last week's exports were almost 1.5 MMT - the highest weekly total in twenty months and the third week in a row of shipments in excess of 1 MMT. Corn: Dec 12 Corn closed at USD7.61 1/4, down 1/4 cent; Mar 13 Corn closed at USD7.59 1/4, down 1/4 cent. Unlike soybeans, corn exports continue to lag, with today's inspections only a fraction of those for beans at just 9.6 million bushels. That is only around a third of last year's total for this week and falls well short of the required 24 million needed to hit the USDA's projections for the full season. "Parana, Brazil's leading corn state, is very dry as the spring planting season begins. An 8-inch (200 millimetre) moisture deficit has accrued from a 3-month drought. Rainfall was very disappointing again last week with traces- .20 inch (0-5 mm). Average weekly rainfall is 1.6 inches in October," say Martell Crop Projections. Persistent hot temperatures in October have added to moisture stress frequently topping 90 F. After the close the USDA reported corn harvesting at a record 87% complete. The five year average is only 49% done at this time. Wheat: Dec 12 CBOT Wheat closed at USD8.78 1/4, up 5 3/4 cents; Dec 12 KCBT Wheat closed at USD9.15 1/2, up 7 1/2 cents; Dec 12 MGEX Wheat closed at USD9.47 1/2, up 5 cents. 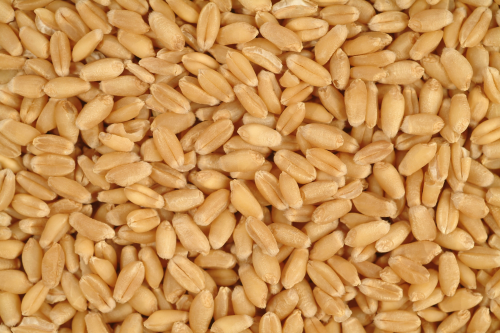 Iraq is tendering for wheat, with the results due later in the week. Few expect US wheat to get a look in as it still looks too expensive compared to other origins. In the US "wheat conditions have grown dry in the main US bread wheat states in October. Some areas in Oklahoma and southern Kansas have received less than 15% of normal rainfall. Gusty winds last week whipped up dry fields producing a dust veil from southwest Nebraska through Kansas into Oklahoma. Kansas topsoil moisture was reported at 72% short-very short and 28% adequate in the mid- October USDA weekly crop letter from USDA," say Martell Crop Projections. After the close the USDA pegged US winter wheat plantings in line with normal at 81% complete. These areas now desperately need rain. Weekly export inspections of 16.4 million bushels were an improvement from last week's paltry 7.0 million, but still below year ago levels. 22/10/12 -- EU grains closed mostly higher on the day with Nov 12 London wheat up GBP1.75/tonne to GBP206.00/tonne whilst Nov 12 Paris wheat was EUR0.25/tonne firmer at EUR263.00/tonne. Catching the eye was Nov 13 London wheat closing up GBP3.75/tonne at GBP182.50/tonne, setting a fresh closing high for the contract's lifetime, as the trade already starts to get anxious about prospects for next year's crop. 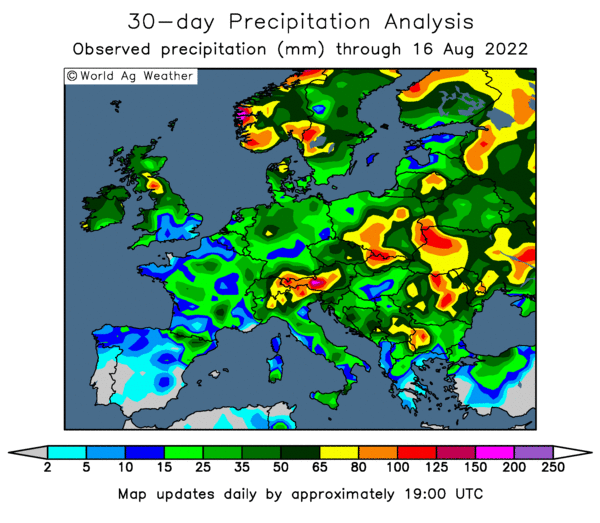 There are concerns that the recent excessively wet conditions might cause some problems in France too, where northern and western areas have received 5-8 inches of rain over the past thirty days - two to three times the normal volume for this time of year. French winter wheat plantings are only 20% done according to FranceAgriMer, a year ago they were past the halfway point at this time. Vivergo appear to be gearing up for their scheduled opening around the turn of the year, as they are apparently offering their distillers grain by-product into the market for Feb/Apr 2013, I hear. 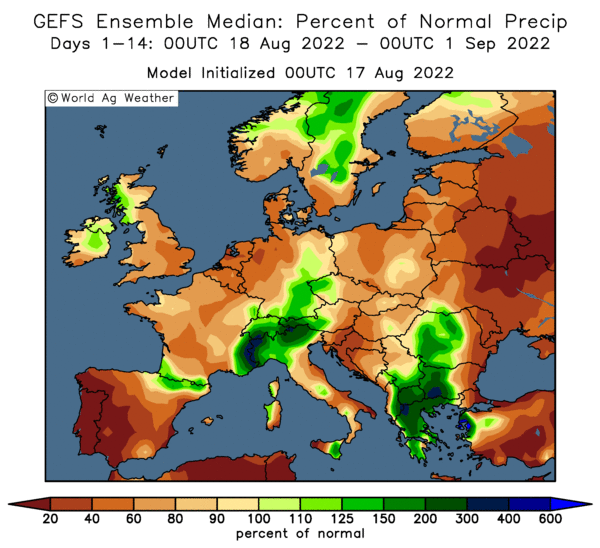 Ensus recently said that they would be prepared to take UK wheat down to 60kg/hl bushel weight following this year's crop disaster (subject to seeing how well such wheat actually performs). Vivergo will no doubt also be pondering their stance on this issue. The EU Commission's MARS unit made minor tweaks to last month's yield estimates today, with small rises for corn, barley and OSR and a small decrease for wheat. They put 2012 EU-27 corn yields at 6.07 MT/ha, 20.6% down on last year and 12.6% below the 5-year average. Wheat yields were said to have averaged 5.25 MT/ha, 2.5% down on last year and 1.2% below average. 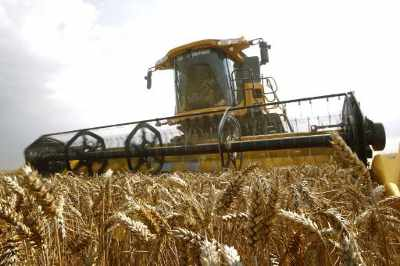 Barley yields were pegged little changed from a year ago or the 5-year average at 4.34 MT/ha, whilst OSR yields were estimated 6% up on last season at 3.03 MT/ha. UK wheat yields still look way to high versus other trade estimates at 7.35 MT/ha. Barley yields here were forecast at 5.72 MT/ha and OSR yields at 3.48 MT/ha, a little above Defra, but not startlingly so. The trade seems a little less certain today that Ukraine has introduced a Nov 15 wheat export ban than it was on Friday. What is reported is that they have already exported 7.1 MMT of grains, of which 3.6 MMT is wheat, and that they have a further 1.8 MMT of wheat contracted to ship. That takes them well over the agreed 5 MMT voluntary ceiling anyway, so suffice to say that they are out of the wheat export market until new crop. Russia say that their grain harvest is just about over, producing 39.5 MMT of wheat at an average yield of 1.86 MT/ha, 21% down on last year. 19/10/12 -- Soycomplex: Nov 12 Soybeans closed at USD15.34 1/4, down 11 1/4 cents; Jan 13 Soybeans closed at USD15.36 1/2, down 9 3/4 cents; Dec 12 Soybean Meal closed at USD463.80, up USD0.50; Dec 12 Soybean Oil closed at 51.58, down 72 cents. For the week Nov 12 beans gained 11 3/4 cents, meal was down USD1.40 and oil added 91 points. 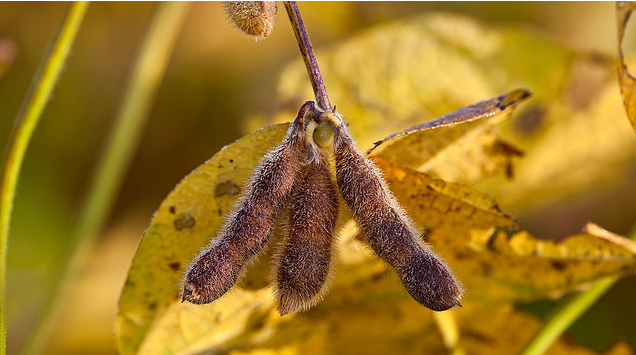 Informa Economics estimated that US growers would plant 80 million acres of soybeans for the 2013 harvest, a 2.8 million increase on this year. A return to trendline yields of 43.8 bu/acre would see US soybean production leap more than 20% to a record 3.453 billion bushels. If true, and there are a lot of if's here, then that would follow up from potential record output from all the main South American producers: Brazil, Argentina, Paraguay, Bolivia and Uruguay next spring. That's a lot of soybeans for China and the rest of the world to pick and chose from. Unfortunately, in the mean time we've only got America's 2.86 million bushel crop this year to scrap over, and 71% of that is sold already. Corn: Dec 12 Corn closed at USD7.61 1/2, up 3/4 cent; Mar 13 Corn closed at USD7.59 1/2, up 1/4 cent. Dec corn was up 8 3/4 cents on the week. Informa placed US corn plantings in 2013 almost a million higher than this year's 75 year record at 97.5 million acres. Clearly, with corn and soybean prices where they are both US and South American farmers will find the acres from somewhere. The USDA attaché in Brasilia estimated corn production in Brazil for 2012/13 at a record 74 MMT, a 4 MMT increase on the USDA themselves and 1.8% up on this year's crop. South Korea bought 63,000 MT of optional origin corn. Excessive rains in Argentina are delaying corn planting, which is currently running around 11 percentage points behind year ago levels. Corn got a boost from a firmer wheat market on the back of reports that Ukraine will ban wheat exports from the middle of next month. Wheat: Dec 12 CBOT Wheat closed at USD8.72 1/2, up 4 cents; Dec 12 KCBT Wheat closed at USD9.08, up 3 1/4 cents; Dec 12 MGEX Wheat closed at USD9.42 1/2, down 1 1/2 cents. Chicago wheat was up 15 3/4 cents on the week. Wheat gave up most of it's early gains by the close of play. Early firmness being tied to reports of a Ukraine wheat export ban. 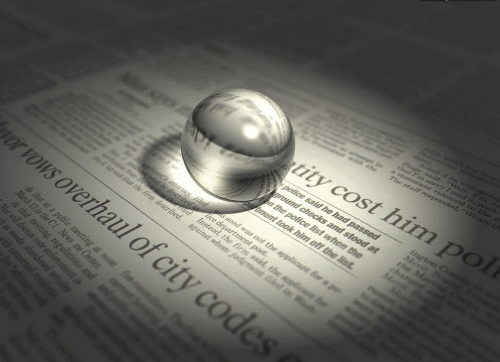 All the popular news services carried the story, although as the day wore on there seemed to be some conflict of opinion as to exactly what had been said. It is largely immaterial as it has been known for some time that the Ukraine government want to cap wheat exports at 5 MMT, and that 3.35 MMT of that has already been shipped. Adding support was a USDA announcement of 230 TMT of US wheat sold to "unknown" for 2012/13 delivery. Informa said that US all wheat plantings for the 2013 harvest will be 56.8 million acres, an increase of just over a million on this year.